was quite amazing (see inset). I used the texture of the paper to produce the misty-like effect. 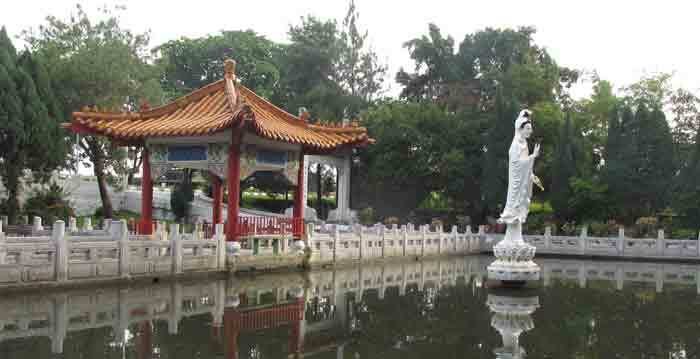 The Perak Tong Chinese Temple is located along Jalan Kuala Kangsar, about six kilometres north of Ipoh and it is among the most picturesque places of worship for the Chinese and a tourist attraction that has drawn people from afar. During the first and fifteenth day of the lunar month and on major festivals, the temple teems with devotees. Surrounded by lush greenery, it has a well-kept yard which includes a pool and several pergolas for visitors to rest and enjoy the scenery. The best time to be here to enjoy the tranquil atmosphere is in the morning when the shadow from the tall limestone hill is cast onto the yard. During the afternoons, the casuarina trees dotting the yard also provide a cool respite. I painted the façade of the cave temple complex and tried to capture the softness of the greenery using wet-on-wet technique. 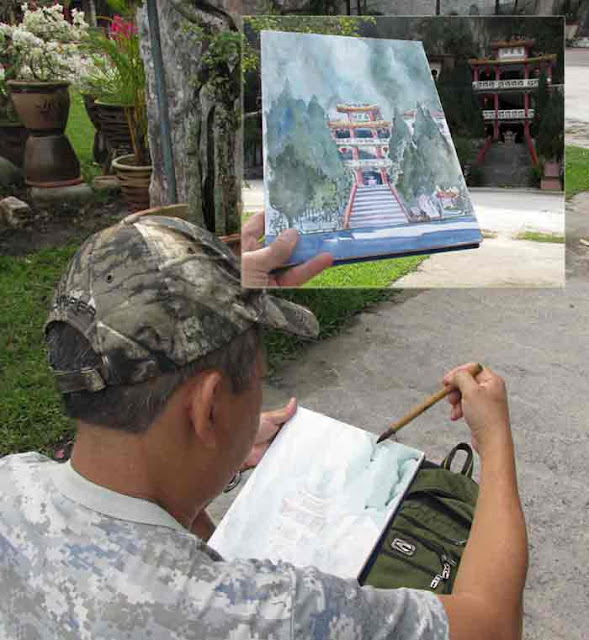 As I was painting, several monkeys descended from the hills and got closer to me. Fortunately, one of the temple sweepers who were around shouted out at the primate and drove it back into the trees. I was told that the monkeys here were as mischievous as those in Batu Caves in Selangor. No sooner than he has spoken, another yell was heard from the other side of the temple ground. Apparently a monkey had made off with a Tupperware containing food which was carelessly left in a visitor’s motorcycle basket. The decades old Hua Nam cafe is still a popular haunt for locals. Some years back, when I first visited Muar on the way back from Singapore to Malacca, if I am not mistaken, this was the first premises I stopped at. We were famished that afternoon and seeing an uncrowded café with ample parking space in the street was a sight for sore eyes. Since then, whenever my wife and I are in Muar, this will be one of the first food outlets we would stop here for coffee. This building, established in 1917, is located at the intersection of Jalan Yahya and Jalan Meriam. I was attracted by the old features of this building, and even more fascinated with the two colours used on the same building – light blue at left and pink at right. A local told me the reason for the different colour was because Muar’s buildings had been thematically painted to differentiate their location according to the streets. 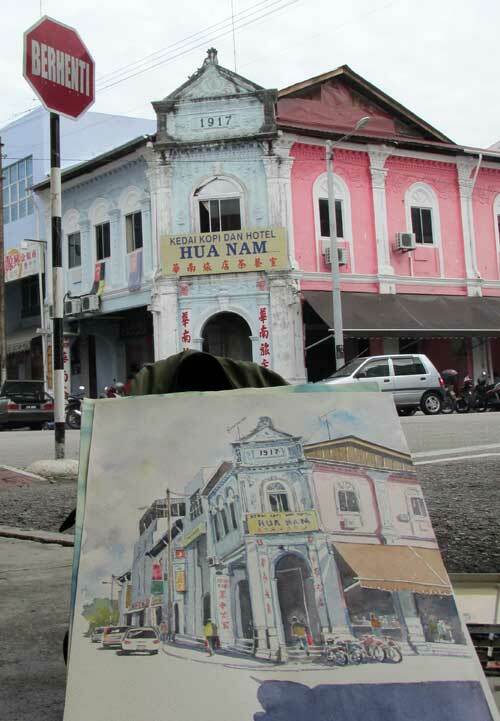 However, the building painters must have been stumped by the location of Hua Nam Café must which lies smack in the corner of the two roads and they decided to make it easy by painting the same building in two colours to differentiate the two streets flanking the façade. 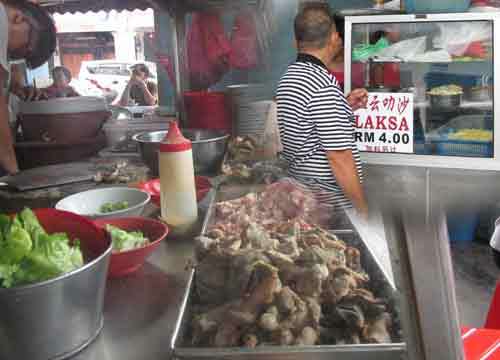 Located within Hua Nam Café are a laksa stall and a mixed-meat or “chichap” (non-halal) rice seller. Although the café serves toast and eggs with coffee, we noticed that the laksa stall is highly popular both with seat-in as well as takeaway customers. Priced at RM4 a bowl, the noodles (a choice of rice vermicelli or yellow noodles, of half of each) come in a very fragrant curry gravy. I can’t say if it is the affordability or the lipsmacking goodness of the laksa that is drawing a steady stream of customers. Service is also very fast. I sketched and painted this building from across the street, seated on a folding chair at the five-foot way of a shop. The outlet was closed during Chinese New Year so I could complete this piece without hindering pedestrian traffic. 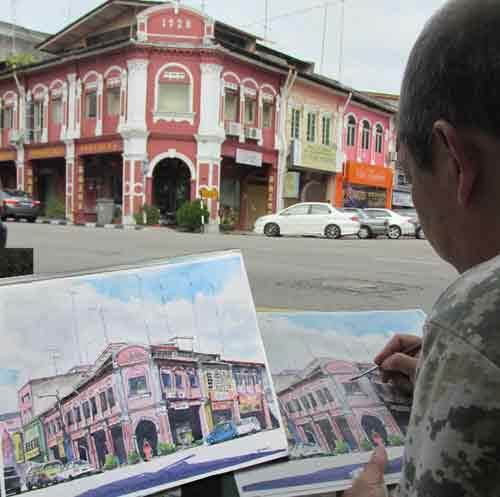 This building in pink is another striking attraction that lends old world charm to Muar. Although there was heavy cloud cover that morning, I decided to paint a strong shadow in the foreground to add interest to the perspective. The clouds were painted with basic primaries, with a tint of warm colours, and some patches of cobalt blue to depict cloud-holes to show the upper layer of blue skies frequently seen during Chinese New Year. TWO weeks into the implementation of the Goods and Services Tax (GST), I am surprised that my wantan mee seller had not increased his prices. A bowl of wantan mee with several pieces of barbecued meat and a small bowl of soup with wantans, are still priced RM4 at his stall in my neighbourhood in Setapak. Earlier this year, when I spoke to the noodle seller about the GST and how prices would be increased, he said he would try to absorb the costs as he best could. He has kept his promise. It must have been a tough decision, I thought, since every stall owner in that small coffeeshop they were operating in had raised their prices due to GST. Even the coffeeshop owner has raised his prices twice — once just after Chinese New Year and now, after the GST’s implementation. A small cup of milk tea now costs RM1.60, instead of RM1.20 last December. A cup of Nescafe now costs RM2.10. It used to be RM1.50. I am not sure these will remain till year’s end. I have known this noodle seller from afar since his mother’s time. She had been selling wantan mee at the wet market nearby then. I had also known her to be a kind and generous lady. At the time, the current noodle seller was only a teenager who helped his mother at the stall. Back then, his mother charged RM1.50 for a bowl of noodles. It was the cheapest in the area during the 1990s, I think. I recalled having asked her if she could make enough to cover her daily expenses with what she had earned. She replied that if she was frugal, she probably could. “Sometimes when doing business, it should not be for profits alone,” she had told me. “One must also be guided by one’s conscience.” She then added that she could not raise her prices any higher because most of her customers comprised the poor who were also trying to make ends meet. Apparently this woman’s charitable nature had also been inherited by this son who had been selling noodles for over two decades now. Whenever I am at his noodle stall, I feel thankful that there are people like him. I am sure those whose purse strings had to be tightened in these difficult times are also just as grateful for that bowl of noodles at old prices. It would be very simplistic to reason that he is keeping prices low as a means to attract more customers. But having observed him deal with his customers over the years, I sensed a deeper conviction — of his concern for the welfare of others. It would be very tempting to raise prices when everyone had raised theirs, I’m sure. He reminded me of a food deliverer at the college where my daughters were studying years ago in Pahang. Although the college had a canteen, the canteen operators sold dishes that were mostly spicy and meaty. Some of the students who were not accustomed to spicy food, and a few were vegetarians, sometimes had to go for days on bread. As the nearest town was about 15km away and there were no public transport out, these students had very little choice. However, this food deliverer, I learnt, would take orders from the students by phone and ride his motorcycle all the way to deliver the meals each evening. For a packed meal priced at only RM3.50, his presence was god-sent to the students. I doubt the man’s 15km journey was worth it if he less than 10 orders, but on numerous occasions, I was told, he delivered even if it was less. At a chance meeting, I once asked if the profit he made from his trips was worth his time and fuel. He replied that if he did not do it, the students would face hardship or the possibility of even go hungry. Sometimes, in the haste in pursuing our daily needs, we miss noticing the simple acts of kindness that often make life little bearable for others. When we do come across one— if scepticism did not cloud our judgement first — the rare opportunity warms our hearts and remind us of how easy it is to be charitable. We do not need to be exceedingly wealthy nor be endowed with a position of power. Sometimes, by just doing what little we can to benefit those around us also counts as an act of philanthropy. 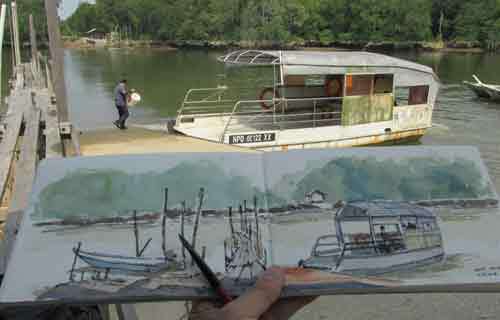 The last of the remaining ferry service along Sungai Sepang near Bukit Pelandok. It is the last remaining privately operated ferry service plying the towns of Bukit Pelandok in Negri Sembilan and Sungai Pelek in Selangor, on the otherside of the Sepang River. There used to be two operators but one closed down due to poor demand. 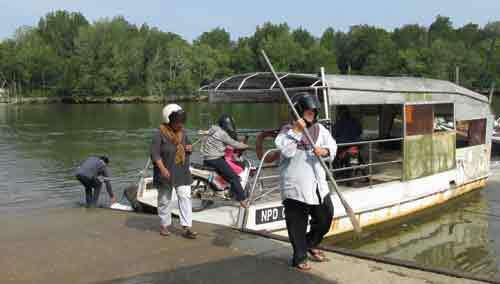 Now the lone operator services residents from the two neighbouring States using a single riverboat, operating from a terminal near Kampung India in Bukit Pelandok. 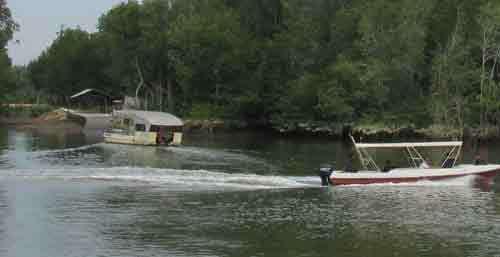 The riverboat is powetred by a 15-HP outboard engine, piloted by the third-generation member of the family-owned business. There is a spare outboard motor on standby in case of a breakdown. There are no deck chairs as the crossing takes less than five minutes. Life jackets and life preservers are available. The ferry service begins at 6.35am and ends at 7.25pm daily. Passengers are xharged 50sen per trip for an adult, and 30 sen per child. To bring motorcycles onboard, you pay an additional 50sen. For bicycles, it is 30sen per vehicle. To get to the terminal from Bukit Pelandok side, drive straigt until you reach the Bukit Pelandok Tamil school, adjacent to a Hindu Temple. About 300m from the school on the straight, you will come to an X-junction where a green timber sundry shop is visible on your right. The road beside this shop will lead you straight to the jetty, about 1.3km away. The ferry making a turn at the Sepang side.